My 71st birthday, and a couple of days off spent with F in Florence in the splendid apartment of generous friends. 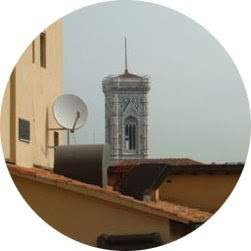 Sitting here on their terrace I can see among the famous silhouettes the top of the building that I drew sixty years ago when, propped up in a hospital bed, I copied an illustration, itself no doubt fairly crude, of Giotto’s tower from a book. I still remember the excitement of having a fine sheet of white paper on which, with a mapping pen and sticky Indian ink, I followed the fascinating lines of the decorative façade. I suspect it was the first thing that I had made that I thought of as art… a special piece of paper with something special on it. It was a one day wonder in the ward and considered by nurses and fellow patients to be amazingly (I remember the word most often used) ‘lifelike’. I’d no doubt blush or smile to see it now. But what would my eleven year old self think were he to open his future studio door and see the painting that he is doing in 2008? He might well be amazed, even dismayed, though 'lifelike' would be the last word he would reach for. Lifelike, however, is a term that has gained in amplitude. 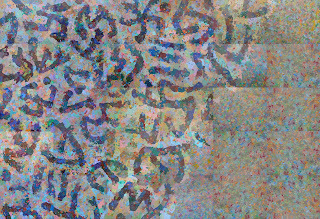 Our image bank now contains the galactic choreography revealed by the Hubble telescope and the organic dances that, in miniature parallel, are presented by electron miscroscopy. We begin to apprehend a unity in the cosmos at the visual level. Open any scientific journal and it is hard to tell without reference whether any illustration is of an infinitely large or infinitely small event; especially since they are made cousins by the current taste for schematic colour coding. To be armed with this larger license as to what is lifelike becomes as frightening as it is exhilarating. Even the panels supporting my picture teem with inorganic activity as, in all directions and without end, subatomic particles ping and caper about through its inert-seeming fabric. On top of this my picture is a battleground in which delicate manoeuvres in suspended combat combine to describe a hesitant moment of a situation in flux. Looking again across to Giotto’s tower I register that it is itself lifelike. Its austere intricacy, perfection of marble interval and balanced dialogue of dark and light, mirror platonically something of the structure of the world. Having called these notes (as republished in Turps magazine) The Biography of a Painting, I have implied yet another version of lifelikeness. The history of the picture’s making is the story of its life, its moving through time to a close. Since I am edging on to the final panels it more and more resembles my own life which has a great deal more past than future. Unlike human existence however it invites revision and, at the end of the last panel (having closed off in one sense the future) I can go one better than nature and reopen the past. I must admit that your vocabulary and most of the discussion is way above my head but I have loved your work for a long long time. Why do you refer to yourself in the 3rd person in a lot of this blog? Hope to see you blogging away on your 72nd birthday. Nice portrait of jeremy isaacs in NPG..by far the best of an otherwise terrible photorealist bunch. should be an inspiration to younger artists or do they think the painted portrait's dead i wonder?